Calling all ladies who love the gym! Tell us: What’s your favorite fitness accessory? If you said it’s your treadmill, weights or bike, that’s great! However, keep in mind that it is having the proper accessories to protect your body from injury that will really give you the best workout possible. When it comes to the best fitness accessories for women, consider weight lifting grips, wrist wraps and lifting belts. Just how can these accessories help you get a better workout and prevent injuries? Let’s take a look. Hands down, weight lifting grips are among the top fitness accessories for women. We’ve heard the story many times. You tried lifting grips, lifting straps, and perhaps even power hooks. And you hated them. They didn’t fit properly. Even worse, they weren’t thick enough to function as a grip pad, and left your hands totally chafed. It was also frustrating that they took up all of the room in your gym bag. But what if we told you that one of the best fitness accessories for women would not compromise your performance or fill your gym bag to the brim? That’s right – with our Cobra Grips weight lifting grips for women, you get a grip pad pair to protect your hands from chaffing, lifting straps for improving your grip and power hooks to help you keep hold of the bar… minus all of the things you disliked about your old gym accessories! Cobra Grips are made with flexible neoprene, measuring 6 millimeters in thickness. This means that they provide ample cushioning that can outperform any other grip pad. Their no-slip design keeps your hands perfectly positioned on the bar with none of the sliding you might experience with ordinary lifting straps. Their ergonomic design ensures the safety of your fingers, hands and wrists. They’re also fully adjustable, so you can say goodbye to awkwardness! Need wrist support? Wrist wraps are highly useful fitness accessories for women. In addition to weight lifting grips, wrist wraps can also make a real difference on each lift you do in the gym. They don’t add many pounds to your total workout, but they’re a perfect way to support your wrist if you’re power lifting, doing dead lifts or squatting. We sell this valuable fitness accessory for women as a pair, and they’re one-size-fits-all. Grip Power Pads wrist wraps feature elastic 2-size thumb loops and an extended length Velcro closure. Our collection of fitness accessories for women includes lifting belts. Lifting belts aren’t just for guys! Here at Grip Power Pads, we’ve designed an amazing lifting belt which is sure to make some Top 10 lists when it comes to fitness accessories for women. Many of you may be thinking, “Do I really need a lifting belt for my weight routines?” The answer is yes. Lifting belts are ideal for keeping your core engaged and helping you maintain proper form. They’ll allow you to do more reps and greatly reduce the chance that you’ll get an injury. Our black and pink weight lifting belt is stylish, and is made for women’s figures. At 5 inches wide, it’s bigger than other belts to give you maximum support and comfort. The best part: It’s fully adjustable with Velcro, and there are no buckles to fasten. Grip Power Pads offers the #1 fitness accessories for women. What are you waiting for? Don’t suffer injuries or deal with frustration during your workouts. Take a look at our collection of fitness accessories for women, and make every workout your best! 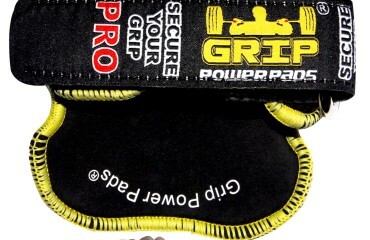 The lifting grips from Grip Power Pads offer this type of protection.